The days leading up to and following Christmas were anything but joyful for many. From severe weather in Texas, to winter weather on the other side of the state. Ice storms and flooding rains from the south to as far north as central Illinois, it will be nice to have a week of just dry weather. 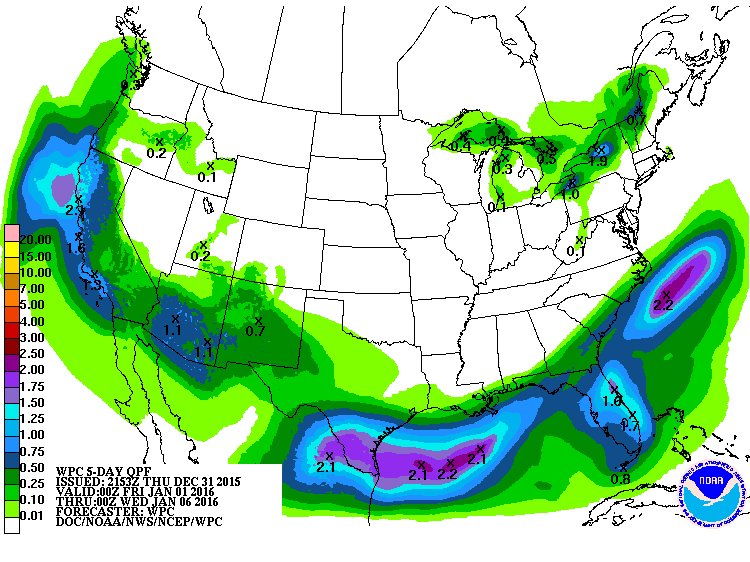 Here's the 5 day precipitation outlook for the United States and as we head into 2016. The southern branch of the jet stream will turn a little more active keeping a lot of the wet weather from the west to the southeast. There is the potential for some flooding with this pattern, but at least for residents along the Mississippi and Missouri rivers, as well as other local rivers who are dealing with historic flooding, skies will remain dry. Unfortunately, river levels will continue to run high and in major flood stage for the next several days, but after the weekend (assuming little precipitation falls) those levels will begin to recede. Each green line you see on the map to the left is a flood warning for some portion of a river. You can almost follow the Mississippi River and where other rivers spill into it. Let's hope the drier pattern sticks around a little further into January. 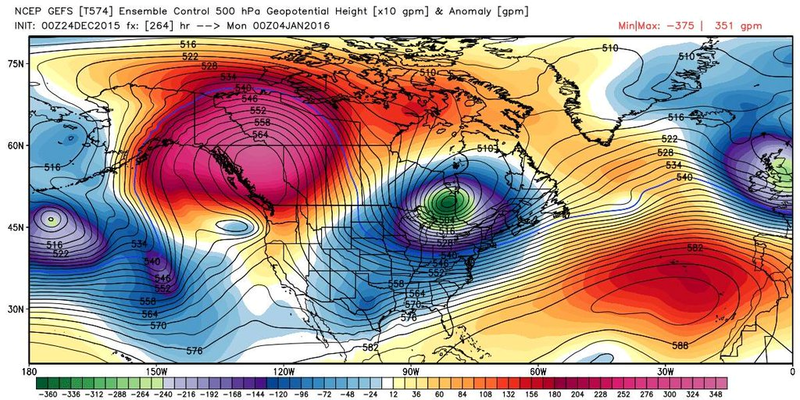 The pattern this winter thus far has not lacked attention. A blocking high pressure system in the Atlantic Ocean and a low pressure system "stuck" near Newfoundland has disallowed extreme cold and winter weather to move into the region. In fact, December 30th is the first day of the entire month where high temperatures remained below the 30-degree mark. This is something that does not typically happen in the Midwest during the month of December. Just how warm has it been? 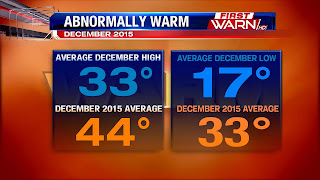 The average high temperature in the month of December in Rockford is 33°. Thus far, we have seen an average high temperature of over 44°. That makes for a +11° temperature difference. The average low temperature during December is 17°. We have only seen one night with temperatures at or below this temperature. 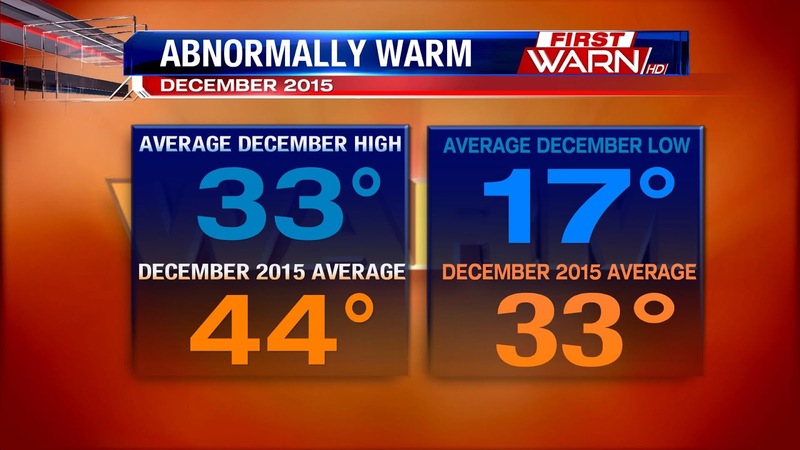 In fact, our average low temperature this month matches our typical high temperature for the month of December. For the state of Illinois overall, the most above average December in terms of temperatures is likely, beating the old record set back in 1923. The good news for cold and snow lovers is a change in the overall pattern is upcoming for the eastern half of the country. The blocking high will be further north. This will allow colder air to filter into the Midwest, Plains, Great Lakes, Ohio Valley, Tennessee Valley, and Northeast more often. Does this mean we will see more snowfall? Not necessarily. While the temperatures will be colder in January and February, we may stay slightly drier than average. Nonetheless, more snow is likely, but it is difficult to say how much and if we will see a significant snowstorm. The cold air is settling in this evening, and it will be around for New Year's Eve. Temperatures will likely start near 20° before warming into the middle 20's in the afternoon. By the time we get into the evening when many of the activities start, clouds will begin eroding and temperatures will start falling through the teens. By the time we ring in 2016, temperatures will be in the lower to middle teens. So while we had a mild November and December, the beginning of January looks colder. There could be a few days where our high temperatures are actually below average! 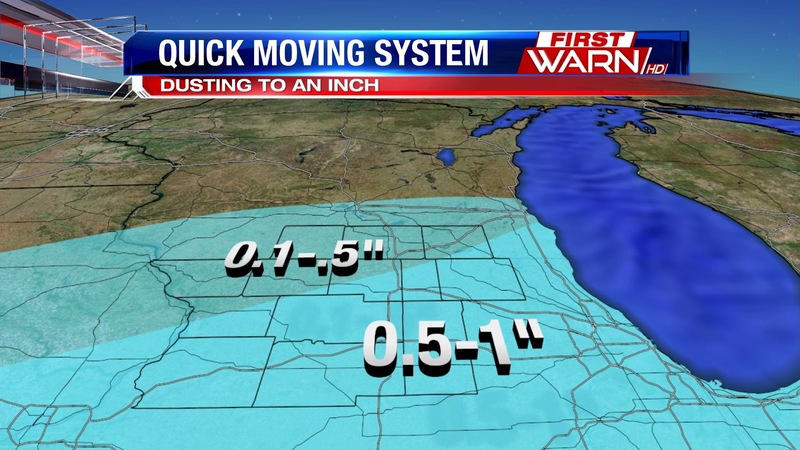 A quick moving system will bring a blast of accumulating snow to the Stateline....at least for some. A potent disturbance in the upper levels of the atmosphere will head northeast from Missouri through north central Illinois. Snow that generated in the eastern plains last night starting tracking to the northeast overnight and is now in Iowa and Missouri. 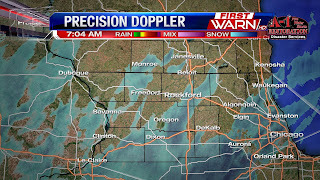 The snow is expanding into west central Illinois and into southern portions of the Stateline. Oregon and Dixon currently getting the snow as it spreads northeast. 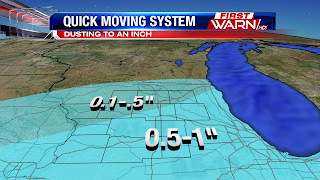 Overall, the Stateline will see a dusting to an inch of snow. 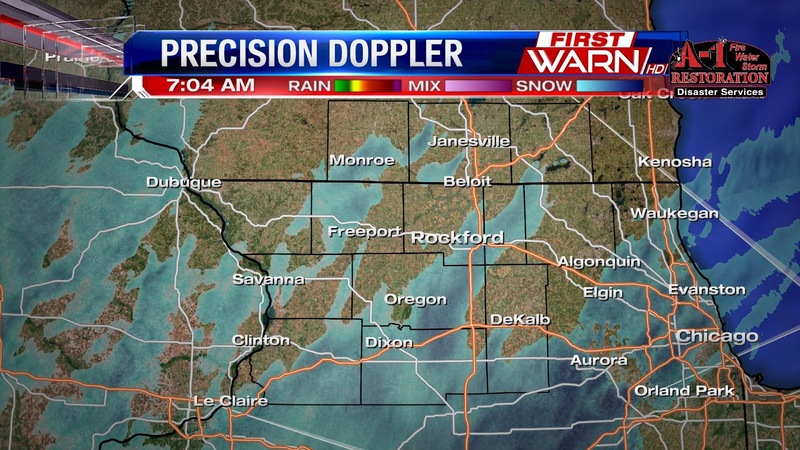 The most favored area of accumulating snow will be south and west of Rockford. Local amounts of an inch are possible, but generally expect a dusting to a half inch. A moderate band of snow is currently tracking through Peoria and will move into the Chicago suburbs, and this area has a better outlook to see an inch of accumulation. If you are heading out along I-90, south on 39, or east on Hwy 34 or 88, watching for quickly reduced visibility and slick roads if they are untreated. Good news is, the snow moves out by noon, and you probably won't need to break out the snowblower again today. It stays dry, but cold, into the new year. December will go down as above average month in terms of temperatures with nearly every day of the month featuring temperatures at or above average. We had one major winter storm, which occurred on the 28th. 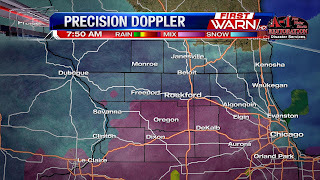 It dropped significant sleet, ice and snow accumulations across the Stateline and caused numerous problems on the roads. Now our attention turns towards what's next. For Northern Illinois and Southern Wisconsin, a potent, but relatively dry disturbance in the upper atmosphere will move through the region Wednesday morning into the early afternoon hours from southwest to northeast. It will be accompanied by cold air, so the precipitation it does bring into the region will fall as snow. Snow looks likely, but accumulations look light at this time. By the time the snow showers end--and they should be light to possibly moderate at times--we will see a covering to upwards of an inch or so of accumulation. As quick as those snow showers move in, they will move out so that by Wednesday afternoon we will be dry, but cloudy. Then, our attention shifts to the very cold air that will push into the region from Canada. Back on December 23rd, we saw record high temperatures across the area, including a high of 59° in Rockford. Since then, we have seen a steady and steep decline in temperatures. That pattern will continue as we head into the New Year. A downward trend in temperatures is expected to round out 2015 and ring in 2016 as several days in the 20's and teens are forecast, including a high of 18° on New Year's Day. This bitterly cold air will be accompanied by dry conditions, which is good news. It will be some of the coldest air we have seen thus far this season, especially when you take into account how mild it has been. The reasoning behind why it's going to get cold and potentially stay colder for awhile is because of what we refer as the North Atlantic Oscillation and the Arctic Oscillation. These two teleconnection variables have been positive this winter thus far. However, models are suggesting a more negative trend in both of these as we round out December and enter 2016. When these are negative, that usually means colder air from the Mississippi River to the East Coast. 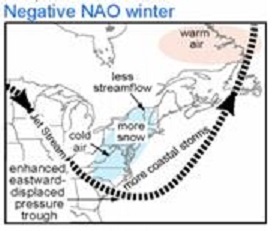 Here is a visual of what the negative NAO pattern looks like during the winter. Notice the "dip" in the jet stream across the Midwest, Great Lakes, Ohio Valley, Northeast, Mid-Atlantic, and New England. That means colder temperatures and a more active pattern in terms of storm systems. While the majority of storm systems affect the Northeast, Mid-Atlantic and New England, the pattern for the Stateline also becomes slightly more active. Therefore, it looks like colder temperatures are here for awhile, and we could see a few shots of snow as well over the next several weeks. While all of the Winter Storm Warnings for the Stateline have expired, we still have to get through a little more snow before a period of dry weather arrives. roads as you head out, so it'll be one of those mornings you'll want to take your time. The rest of the afternoon will be cloudy and colder as temperatures fall into the upper 20's. Another disturbance will pass through the Stateline area Wednesday morning. This will produce enough lift in the atmosphere to get snow to fall. We won't see much in term of accumulations, around an inch or so through noon Wednesday. It will be just enough to keep roads slick again through Wednesday, so another day to take it slower. The rest of the day will be cloudy and colder with high temperatures near 30°. After Wednesday, we'll see a period of direr weather for the Stateline. That doesn't mean we won't see any rain or snow, but overall the active pattern that we had been seeing will begin to chance. The northern branch of the jet stream will actually lift to the north, along the U.S. Canadian Border, and keeps the Canadian cold contained to the north. The southern, and more active branch, will break away and stay contained to the deep south. This keeps most of the wet weather contained to the south near southern California and southern Texas. This doesn't mean we won't have rain/snow chances, it means the overall wet pattern that we have been seeing will slow down. It also means that overall into January we warm up a bit, after a cold week ahead. Not a bad way to kick of the new year! While the magnitude of these values is not all too impressive, these amounts are very high. The reason is because most of the precipitation that fell today was sleet, or ice pellets. When you talk sleet, amounts usually don't exceed an inch. With this system, plenty of moisture was available, and the vertical temperature profile of the atmosphere was just right to support moderate to heavy sleet throughout the event. 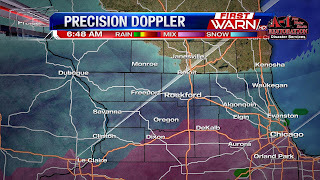 Therefore, we were able to get 2-4" of sleet (with some snow mixed in) to accumulate in many areas. Sleet amounts of 1" are significant because it is all ice instead of snow, which is lighter and fluffier. When you start seeing amounts of 2" and 3", it is evident the storm system was very strong. So, while these totals do not initially look impressive, remember that they are representative of sleet with some snow mixed in. Sleet totals like these are not common as you need the perfect set up in order to get sleet to fall for such a long duration of time. Again, the system is winding down and Winter Storm Warnings will eventually be allowed to expire for the entire region. Roads will continue to be slick and snow/sleet covered through the night with temperatures hovering around freezing. Thus, if you must venture out tonight or very early on Tuesday, make sure to exercise extreme caution. One more wave of moderate to heavy snow and sleet moving through the region this evening. 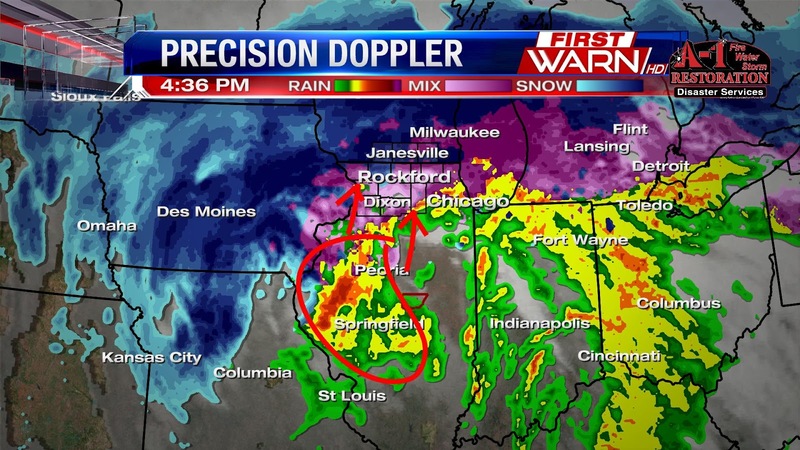 The snow rates are 1-2" per hour in the heaviest bands, which have been highlighted here. Visibility is below a quarter of a mile at times within the heavy snow, and winds are blowing the snow nearly horizontal this evening. These last remaining bands of snow will continue moving north. Expect the precipitation to become light and scattered after 9-10pm from south to north across the area. Earlier this evening we had sleet, freezing rain and snow mixing together. Now thru roughly 9-10pm we have heavy snow moving through the region. Winds will continue to be gusty out of the east northeast up to 35mph, but after 10pm, those will subside. After 10pm, the precipitation will turn very light and isolated as the area of low pressure shifts north into Northern Wisconsin. However, with the snow/sleet/freezing rain totals we have thus far, the roads will remain slick, snow-covered, and treacherous through the overnight hours. Therefore, if you don't have to be out, please don't. Many roads are extremely dangerous to be driving on tonight. Give the road crews time to clean them off, and hold off on venturing out until Tuesday, if possible. 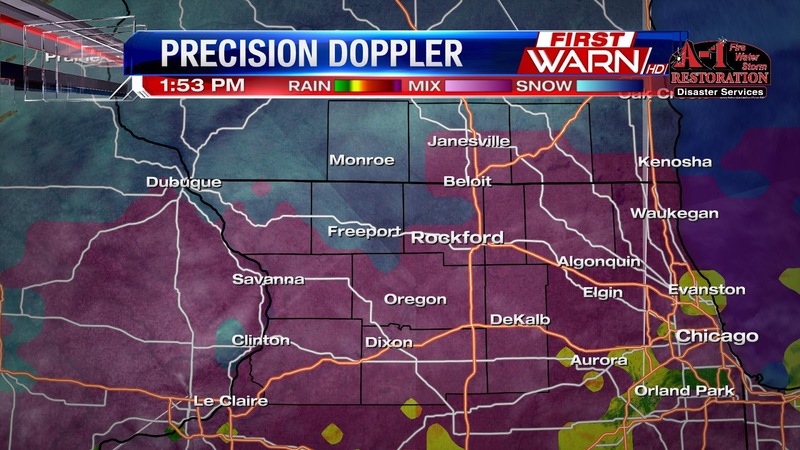 5PM Update: The wintry mix is continuing across the Stateline. It is becoming lighter and more scattered as the moisture moves north. 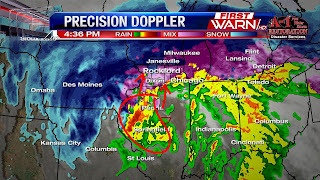 This is the "dry slot" of the storm system. More moisture is filling in to our south, and will stream in this evening in the form of freezing rain and sleet. Some areas to our south will likely remain as plain rain with some freezing rain mixing in. After roughly 9pm, expect precipitation to become much lighter and scattered in nature. Temperatures will remain around freezing through the evening, but the upper levels will warm slightly, which means freezing rain becomes increasingly likely. The chance of freezing rain through the middle of the evening will allow for minor ice accumulations. This will lead to the potential for more power outages as power lines and tree limbs will likely become glazed in ice. If you combine even minor ice accumulations with winds gusting upwards of 35-50mph, down tree limbs and power lines become more likely. Current wind gusts are upwards of 30-45mph. These will likely keep up through a majority of the evening. Although precipitation will become much lighter and more scattered after roughly 9pm, temperatures hovering around the freezing mark will keep the roads in bad shape, especially those that are less traveled. Plenty of roads, including US 20 are reporting nearly 75% snow and ice coverage. Therefore, it is highly advised that if you do not absolutely need to travel tonight, that you don't. 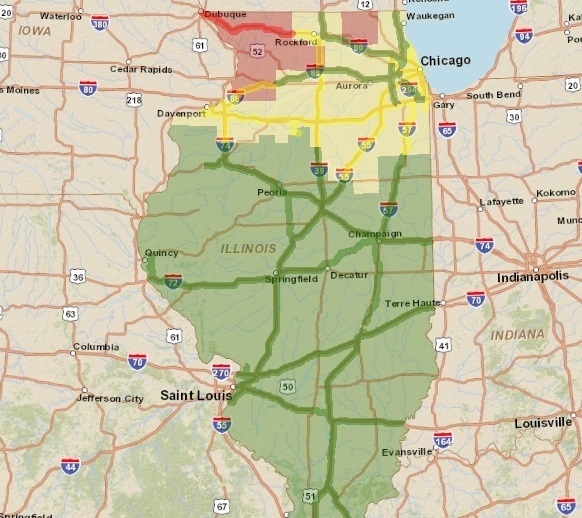 Locations shaded in the red and yellow are where current road conditions are poor. That includes the northern third of Illinois. Multiple spin-outs have been reported thus far today, and if you are traveling across Northern Illinois, the risk of more spin-outs remains in place. Road conditions will improve late tonight as road crews get a chance to catch up to the wintry mess because precipitation rates will steadily decrease. Nonetheless, using extreme caution is highly advisable through the night into Tuesday morning. A few pictures have been sent into the Weather Center of the sleet and freezing rain. This photo shows two windows covered in ice. 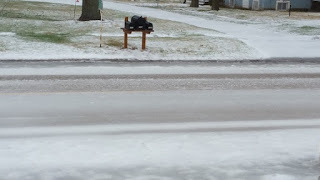 This was a common scene across the region today as freezing rain and sleet had no issue sticking to elevated surfaces. Roadways looked like this throughout the day as sleet, snow and freezing rain came down so heavily, it disallowed the road crews to keep up with it. Roads will continue to be ice covered through the night. 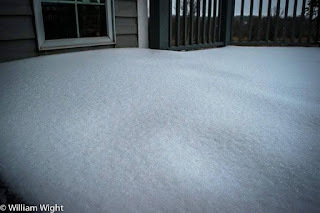 With the powerful winds, we have seen drifts of sleet, snow and freezing rain upwards of 8-10"! This is from Roscoe. Outside of the station, we have a sleet drift upwards of 9"! 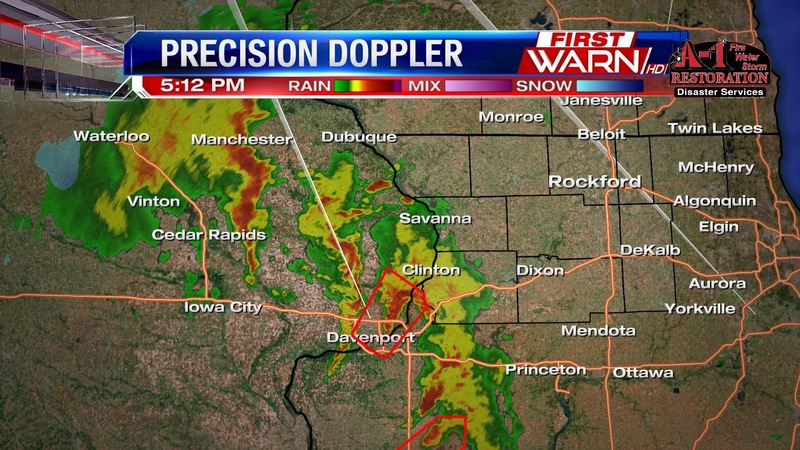 2PM Update: Moderate to heavy precipitation is continuing to fall across the Stateline. The majority of the precipitation has been sleet, but snow and freezing rain have been mixing in as well. 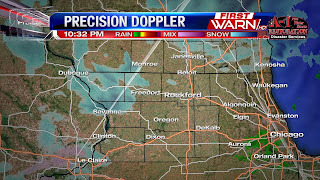 The snow is confined to areas near and north of the Illinois-Wisconsin border. The freezing rain has been just to our south thus far, but with the low pressure center continuing to push northward, warmer air is going to continue to edge its way north. That means the freezing rain will also push north into the region through the afternoon. The good news is this means our ice accumulations will be less than originally thought because we have experienced a longer duration of sleet with the colder air remaining in tact. However, light ice accumulations up to 0.1-0.2" are still a good possibility, especially along and south of U.S. 20 where slightly warmer air has been present. Regardless of precipitation type, there are power outages being reported now across the region. 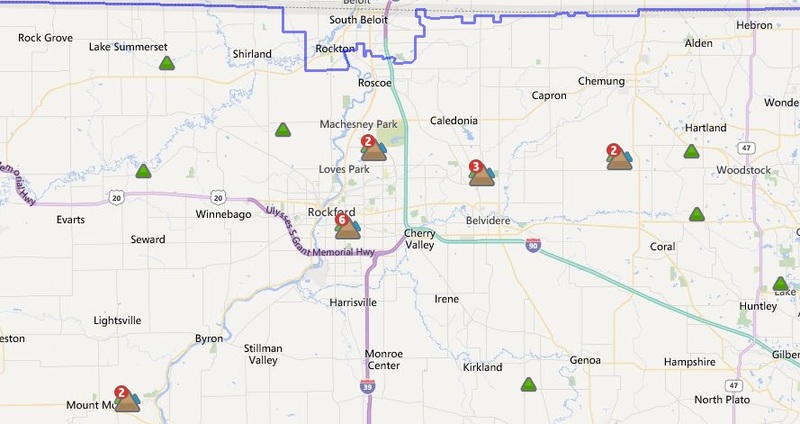 Southeast Rockford has roughly 1,500 customers without power, according to ComEd. And, any freezing rain we get could cause serious issues in terms of power outages because of the strong winds gusting upwards of 50mph. 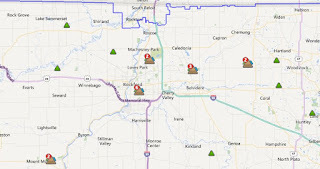 Here is a map showing the current power outages across the region. Expect this trend to continue through the afternoon into the evening with winds continuing out of the east and northeast. The other issue we have out there is ice and snow-covered roadways. This includes highways, main thoroughfares, side streets, and parking lots. The precipitation is falling at such a high rate that road crews simply are struggling to keep up. As a result, many roads--if not all--are covered with slush, which is causing accidents. If you must drive, please use extreme caution and slow down. The City of Rockford has also stated that the Odd-Even Parking Ordinance will go into effect tonight at 7pm. A Winter Storm Warning remains in effect for the entire Stateline. 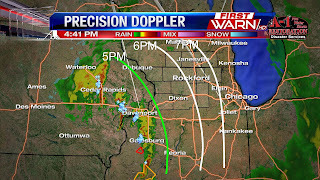 For the counties of Winnebago, Lee, Ogle, DeKalb, McHenry, and Boone, that will expire at 6pm. However, the National Weather Service is considering extending that warnings because wintry weather is expected to last longer than previously thought. For all other counties, that warning goes until Tuesday morning at 6am. Here is the latest timeline for the storm. Expect sleet, snow and freezing rain to continue to mix across the region with winds gusting to 50mph through the late afternoon. Then, as slightly warmer air in the middle levels of the atmosphere works its way in later this afternoon, we could see more in the way of a freezing rain scenario with some sleet mixing in. In fact, in our far southern areas, freezing rain and plain rain could fall late this afternoon into the evening. Then, expect precipitation to wind down and become much lighter by roughly 7pm. It will end in the southern counties first as the moisture moves from south to north. Through the evening hours, plain rain showers mixed with freezing rain is likely as a quick shot of warmer air moves in, but by this time, the precipitation will be noticeably lighter. 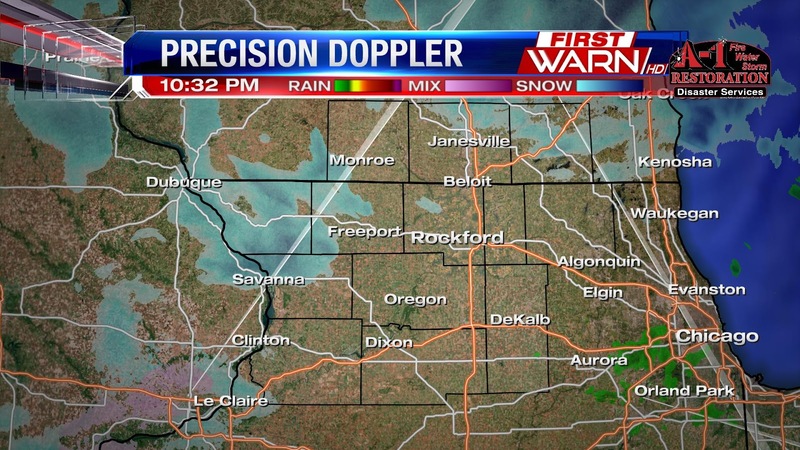 A few light snow showers are possible overnight, but nothing significant is expected from that. 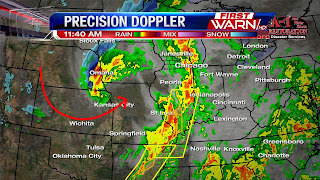 Noon Update: A strong area of low pressure is still tracking through Missouri and is forecasted to lift north over the Stateline through the afternoon. This deepening low pressure system is causing flash flooding through southern portions of the state, and a wind whipped winter mix for northern Illinois and southern Wisconsin. Currently we still have light snow mixing in with moderate bands of sleet, though there are some periods of freezing rain as well. So far through the morning we've see mainly sleet accumulate which is somewhat of a good thing, because it means our ice accumulations will be lower. We will continue to see a freezing rain and sleet mix through the afternoon today and into the early evening as the low continues to get closer to us. This will keep the weatherisk high as we see the potential for ice to accumulate on elevated surfaces such as tree branches and power lines, as well as glazing over roads. As winds today pick up and gust near 50mph today, widespread power outages are possible. Strong winds will also lower visibilites and have can bring down tree branches because of the added weight. Overall, watch for ice and sleet covered roads this afternoon and evening as the winter mix continues to fall. Again, we could see near 0.25" of ice accumulate on elevated surfaces through the early evening, before our surface temperatures warm above freezing. Winds will still be breezy overnight, but won't be as strong as what we see this afternoon and early evening. Marengo,IL: reports of 0.3" inches of sleet so far. 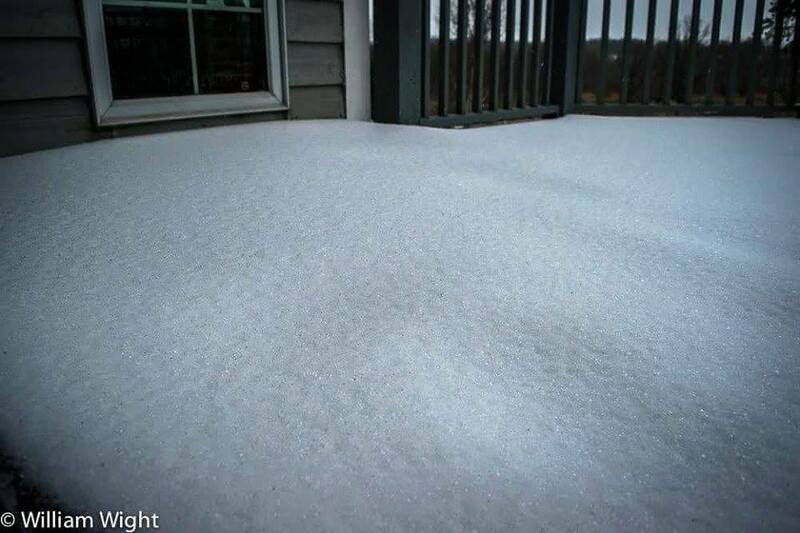 Roscoe, IL: Reports of 0.25" of sleet. 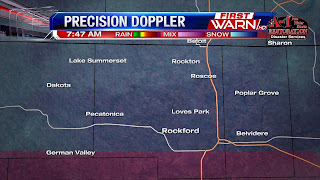 Freeport, IL: 0.10" of freezing rain in Freeport with 1 inch of snow. Sleet accumulations of 0.50"
Milledgeville, IL 0.10" freezing rain reported and under an inch of snow. Patching freezing rain to the south. 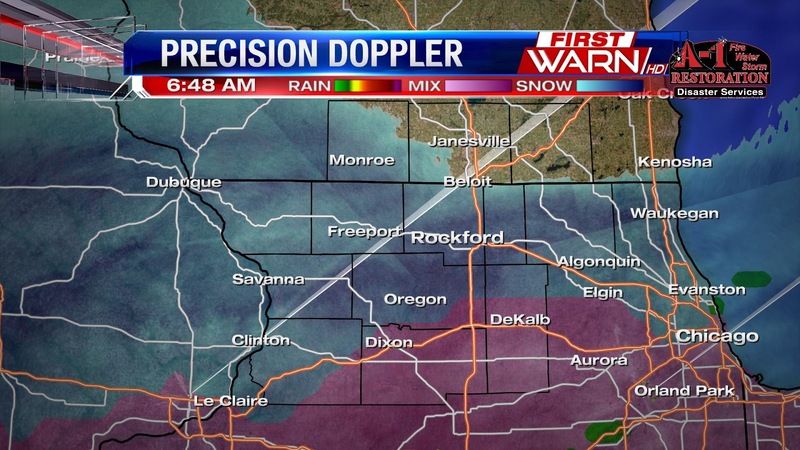 Sleet and snow already spreading north into the Stateline - at the station as of 6:30am not noticing any precip falling - but have reports of light snow accumulation and sleet in Rochelle and Esmond according to our weather watchers. Also reports of snow and sleet in Amboy. Storm Prediction Center released a Mesoscale Discussion about the potential for more freezing rain and winter mix precipitation today. You can see northern Illinois and southern Wisconsin highlighted in the area for a winter mix, including freezing rain, sleet, and snow fall. The greatest potential for freezing rain is nearing 7am through noon with precipitation rates near 0.05" an hour. This means we could see accumulations near .25" of ice. This is because we will have a sufficient warm layer of air up above allowing for any ice to melt and fall as rain, but then refreeze on surfaces as our temperatures at the ground are at or below freezing. Sleet - or ice pellets - are also possible. 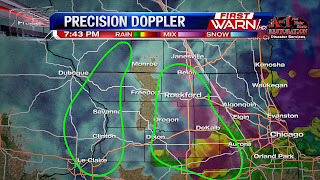 Ice accumulations are also possible along the I-80 and I-90 corridors making driving hazardous. You can keep an eye on road conditions here. 10:00pm Update: Expected wind gusts through Monday evening. Highest wind speeds expected during the afternoon & early evening. 8:45pm Update: Growing a little more concerned with the potential for freezing rain to last longer in the afternoon. If that's does in fact happen, ice accumulations could had up to half an inch. Combined with 45 mph wind gusts, big impacts likely Monday. Second major winter event looks to be unfolding for Monday. Here is your Sunday evening forecast. As I mention below, a change in a degree or two of temperature will have a major impact on precipitation type. Definitely a difficult forecast! A Winter Storm Watch is in effect on Monday from 6:00AM until 6:00PM for Ogle, Lee, Boone, McHenry, and Winnebago Counties. 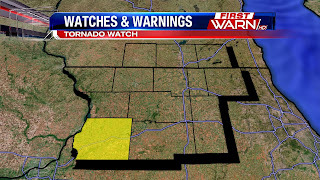 For Carroll, Whiteside, Jo Daviess, and Stephenson Counties, the Watch goes until Tuesday morning at 6:00AM. For the counties in Southern Wisconsin, the watch is in effect until 9:00PM Monday evening. You can see that watch to the left. Every county shaded in blue is included in the watch. The reasoning behind the issuance of the watch is a very large, strong and expansive storm system is getting its act together in Texas tonight. It will continue to strengthen as it begins to move quickly towards the northeast, which ultimately takes the low pressure center over Eastern Iowa and then Central Wisconsin. The system has already produced multiple tornadoes--some of which have been extremely strong, deadly and violent--reported this evening in Texas and Oklahoma. Some of those moved through the Dallas area, where several communities were flattened. On the other side of the state of Texas, there are Blizzard Warnings in effect for upwards of a foot or more of snow and winds gusting to 60mph. 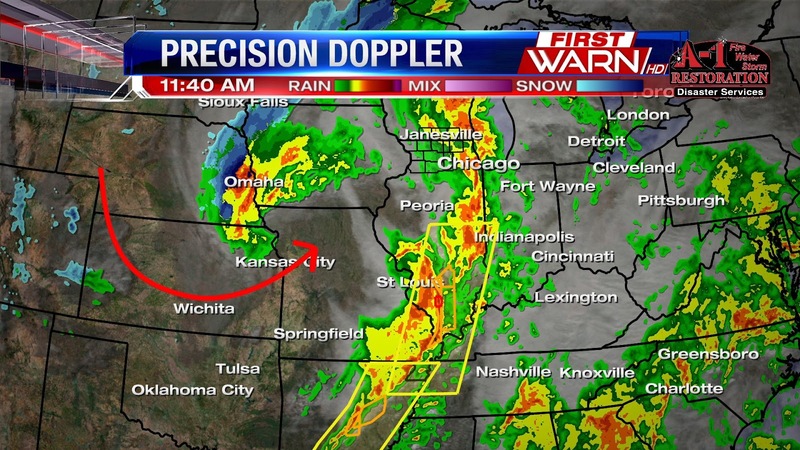 With those two extremes, you can see how strong and potent this storm system is. 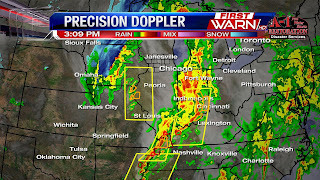 The map to the left shows the current watches and warnings. 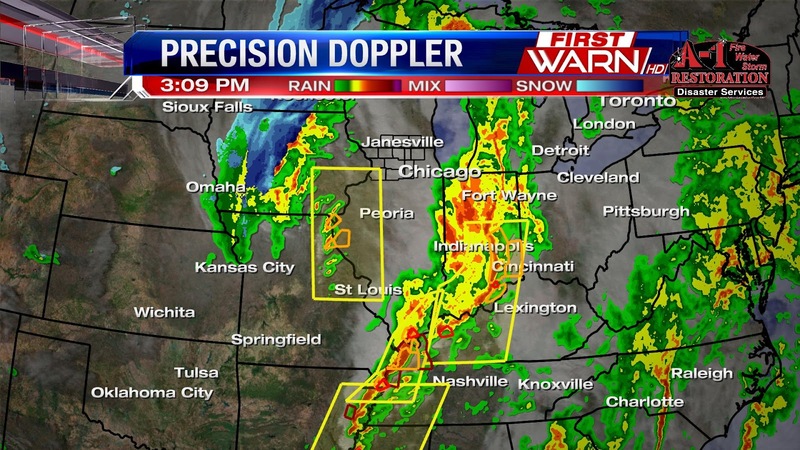 Nearly every color on this map is a watch or warning associated with this storm system. There are Flood Warnings, Tornado Watches and Warnings, Blizzard Warnings, Winter Storm Watches and Warnings, Ice Storm Warnings, and more currently as a result of this major storm system. Areas seeing the wintry side of this system will be seeing significant snowfall, freezing rain, sleet, or a mixture, in addition to very strong winds. Regions seeing the rain and thunderstorms with this system will see several inches of rainfall, the potential for flooding, and the potential for severe weather. For the Stateline, the wintry side of the system will impact us for a long duration before slightly milder air works its way in and changes the wintry precipitation to plain rain where temperatures surpass the freezing mark Monday evening. The precipitation will begin as snow, sleet, freezing rain, or a mix Monday morning around sunrise and quickly overspread the region from south to north. The precipitation will turn moderate to heavy during the morning into the afternoon hours. During this time frame, the majority of precipitation will be falling as freezing rain, which will allow a significant amount of ice to accumulate with such high rates of precipitation. Temperatures will slowly rise through the day into the lower 30's by afternoon. The exact location of the freezing line will be crucial in determining who sees what kind of precipitation, and, as a result, how much. Around 4-7PM, most locations, especially the southern and eastern counties, will be above freezing. That will alleviate some of the icing problems, and it will allow plain rain to fall. Nonetheless, this event will be a significant winter storm. 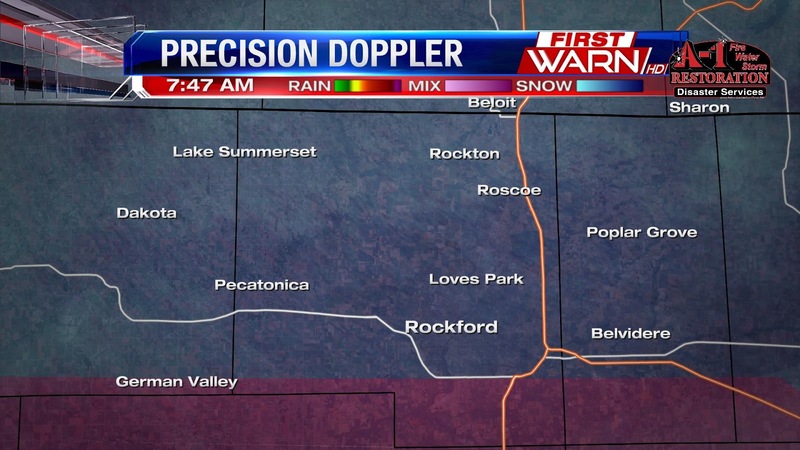 Locations south and east of Rockford will likely see 0.1-0.2" of ice. Winnebago County will see upwards of 0.25" of ice. 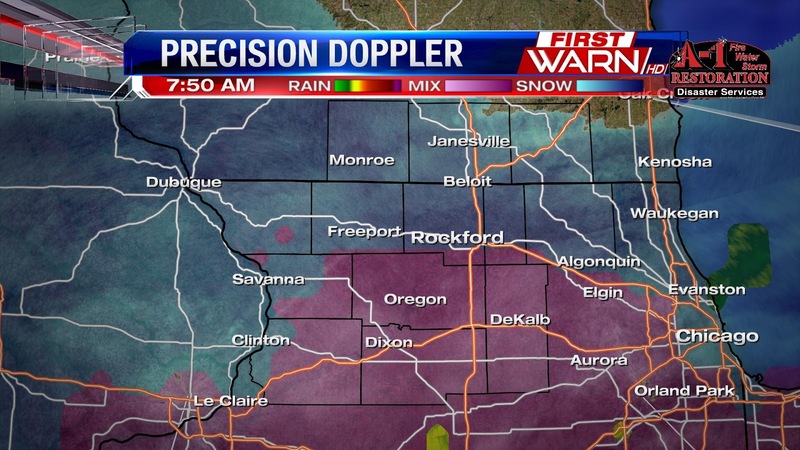 Counties to the north and especially the west of Rockford will see 0.2-0.3"+ of ice. Sleet accumulations are possible as well for the entire region, but that is not expected to be significant. Snow accumulations are possible as well, especially towards the end of the system into Tuesday early morning. 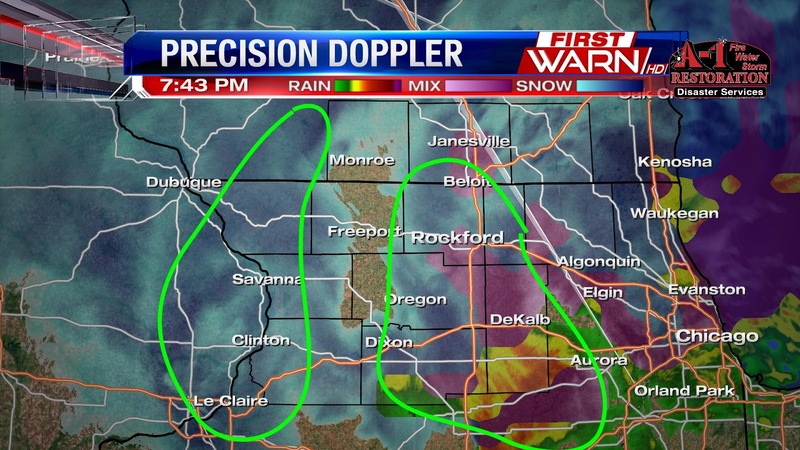 Most of the snow accumulation, if any, will be confined to areas from Rockford and points north and west. A few regions could see a half inch to a couple of inches of snow before the time the precipitation comes to an end. The system will come to an end by 5-9AM on Tuesday morning, but troublesome travel is expected Monday into Tuesday morning for much of Northern Illinois and Southern Wisconsin. It is important to remember that this forecast could change quite a bit if the low pressure takes a track even slightly different than what is projected now. If the low moves further south, we will see more cold air, which means more snow and frozen precipitation. If the low edges north at all, we will see warmer air and more rainfall. The last week of December, and 2015, will not only be turning colder but also a little more active - with more wintry weather than rainy weather. And it all starts this weekend. Saturday morning clouds will continue to increase as temperatures gradually rise into the middle 30's. This as moisture is pulled northward from the Gulf of Mexico. If you're heading out Saturday morning, be prepared for fog and drizzle. There could even be a few light rain showers. The rain will increase a little during Saturday afternoon, but it looks like the more steady rain will arrive Saturday evening into Saturday night. Temperatures will be in the upper 30's, so it will be a chilly rain that falls. Some of those showers will last through early Sunday, with skies staying cloudy Sunday afternoon. Strong high pressure will build across Minnesota and Wisconsin Sunday. This will hold temperatures down in the middle 30's, but with a strong northeast wind through the day it will feel much more blustery. The northeast wind will also cause a layer of drier air to move in over southern Wisconsin and northern Illinois. This will be a key element in our precipitation that is expected to develop by Monday morning. Low pressure will move in from the south, lifting north from Arkansas to Missouri Monday morning and into Wisconsin by Monday night. With this type of winter storm track, it would favor more of a wintry mix for northern Illinois and southern Wisconsin. Meaning a chance for sleet and freezing rain, with the possibility of minor ice accumulation for Monday morning. The forecast, as of Friday night, would favor a snow/sleet mix closer to the Mississippi River with a sleet/rain/freezing rain mix over northern Illinois by Monday morning. A very slow rise in temperatures above freezing (32 degrees) would change any frozen precipitation over to rain before switching back to a freezing rain/snow mixture by Monday night. With this winter storm event still about 60 hours away, there is time for this track - and forecast - to change. There has already been a slight shift of the low pressure system to the west which could mean a slight increase in surface temperatures over the area. This would slowly eat away at our wintry mix potential leaving us with a higher chance for rain. Either way, if you're returning back to work or have family heading home know that the weather will likely be a high impact for travelers. Be sure to stay up-to-date with the weather this weekend! We have been stuck in an above average pattern thus far this cold season. That has been a result of El Niño displacing the jet stream to our north. That pattern results in milder temperatures for the Upper Midwest, Great Lakes, and Northern Plains. However, forecast models are picking up on a pattern change as we head towards New Year's and ring in 2016. That pattern change is in the form of much colder air. A breakdown in the ridge that has dominated in the eastern half of the country will occur the week of New Year's, which will allow colder air to move in from Canada. That is evident on the map above that shows the geopotential heights. That is a meteorological term that could be discussed for months. What you need to know is that areas of blue and green represent lower heights, or colder temperatures. On the other hand, the areas of orange and red--what we have been seeing this winter--are large heights, or warmer than average temperatures. This pattern has been showing up on forecast models for quite some time, so there is consistency among the models, which is reassuring. We will get colder? Yes. How cold? It is difficult to answer that with high confidence as of right now. However, one forecast model is showing temperatures during the nighttime around New Year's Day in the teens and potentially single digits. In fact, here are the projected temperatures on the morning of January 1st. Note the influx of much colder air from Canada resulting in much of the country seeing sub-freezing temperatures. Teens are showing up over Northern Illinois and Southern Wisconsin, which would be some of the coldest air we've seen this year. Is this going to happen? Not exactly. This is simply a model's thoughts on what the morning low temperatures will be on January 1st. What is important is that it shows the colder air like the long-range model above shows, and it shows how cold we could get. Does the cold mean we will also see more wintry weather like snow? Not necessarily. It increases our chances of seeing snow simply because the colder air will allow more frozen precipitation to fall instead of plain rain. You still need a storm system and/or low pressure to develop and bring precipitation with them. Just having cold air in place is not enough. The good news for any snow lovers out there is the models have been very consistently showing a low pressure system developing in Texas on Sunday and strengthening as it moves northeastward towards the Stateline. After a couple rounds of rain and strong winds yesterday, the weather turns peaceful in the Stateline for Christmas Eve and Christmas day. Temperatures today will climb to about 40° under mostly cloudy skies with winds from the SW at 5-15 mph. There is a small chance for light snow showers as we head through the mid-afternoon and early evening. A strong wave of energy is currently bringing snow into western Iowa and will track into the Stateline. Little accumulations are expected, but this could cause some slickness on the roads, so use a little caution as you head home from work. As Santa drops off his presents in the Stateline tonight temperatures will be fall into the upper 20's under mostly cloudy skies. Evening flurries are possible early in the evening before drying out overnight. Christmas day will be a beautiful afternoon with temperatures in the low 40's and a lot of sunshine. Much Colder Air Moving In; Snow Next Week? After a cold front moved through this evening, temperatures have begun to fall as colder air is ushered in from the north and west. That means it's time to say "goodbye" to the mild 50's we saw on Wednesday. By the time we wake up on Christmas Eve morning, temperatures will be roughly 25° cooler than what we saw Wednesday afternoon. However, it will still be an above average day in terms of low and high temperatures on Christmas Eve despite it being significantly cooler. The cooler air will remain in place for Christmas Day with temperatures only expected around 41°. But, that is still above average in terms of temperatures. Rain moves in on Saturday with slightly milder air arriving, followed by a few flakes possible on Sunday. With a track like this, the low will be close enough to the region to draw in enough warm air to give the Stateline a mainly rain event. And that is typically the case with these winter season storm systems. The stronger they get, the more warm air they draw in. And the closer they are to the Stateline, the warmer we are. Therefore, with these winter season storms, we look for the lows to move across Southern Illinois into Central Indiana if we want sufficient cold air to support snowfall. With Monday's storm system, it looks like it will move slightly too far north to allow an accumulating snow to occur for much of the Northern Illinois and Southern Wisconsin region. With a track more similar to this, there is a higher probability of seeing snowfall, which could accumulate. So it is a storm system that bears watching, especially because we have not seen much winter-like weather in December. 5:32pm Update: A line of showers and thunderstorms is approaching the region from the southwest now. 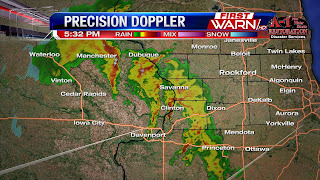 It has entered Jo Daviess, Carroll, and Whiteside Counties. 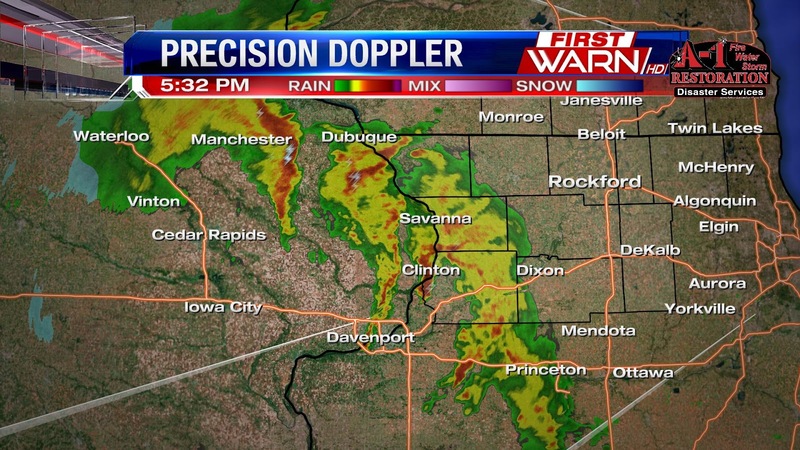 So far, nothing severe for the Stateline, but moderate to heavy rain and lightning have been reported. The severe threat does not look as concerning as it awhile ago, but there is still a threat for some severe weather as this moves through this evening. 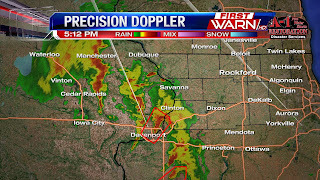 5:10pm Update: Thunderstorms continue to arc northeast through the Quad Cities, with a tornado warning earlier for the Quad Cities. As low pressure moves through northeast Iowa, the amount of spin in the atmosphere will help sustain these thunderstorms. Here is the current radar as of 4:41PM this afternoon. Scattered showers and storms off to the southwest will continue moving quickly towards the region. Some of them have been strong to severe at times. 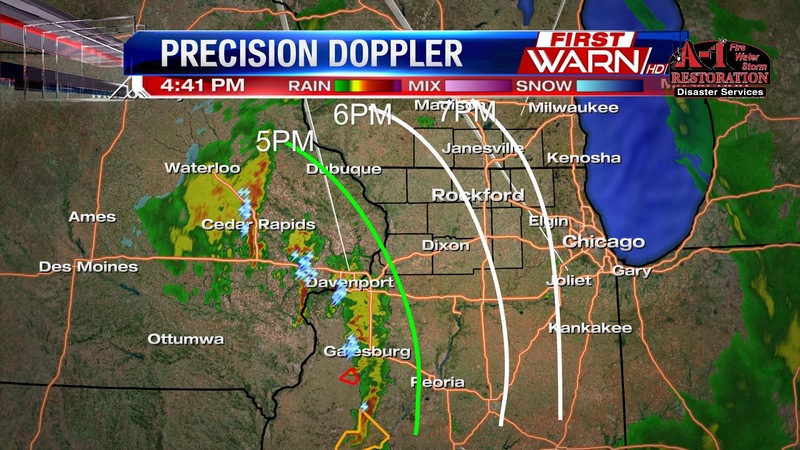 Also on the radar is a rough estimate of when the line will affect portions of the Stateline this evening. 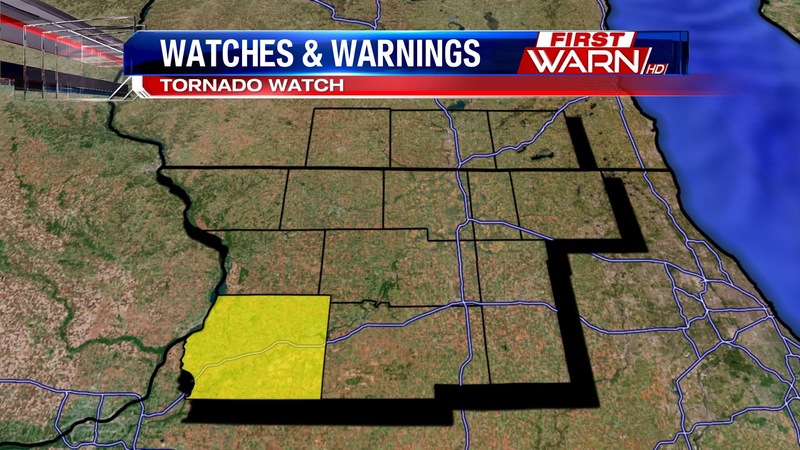 The Tornado Watch out until 8PM includes only Whiteside County at this time. This watch could be expanded to include more counties across the viewing area this afternoon. As the newest model data come in, the time period with the highest probability of thunderstorms, including severe weather is from roughly 4:30pm until 8pm as storms that are currently developing in Northeast Missouri strengthen and rapidly move towards the Stateline from the southwest. Below is the current radar and the timeline for the rain and storms. 1:00PM Quick afternoon update: A severe watch is possible just south of the Stateline area. After rain and storms from earlier this morning, there is some clearing taking place across portions of Missouri as dry air wraps in around the low. Along with this a strong shortwave tough, or band of energy and upward motion, is being noted ahead of a cold front. With this there is plenty of atmospheric shear or winds changing direction with height in the lower levels of the atmosphere. We will watch for individual storm cell development to the southwest this afternoon, because those types of storms have a better ability to rotate. In this area heavy rain, damaging winds, hail, and an isolated tornado is possible. 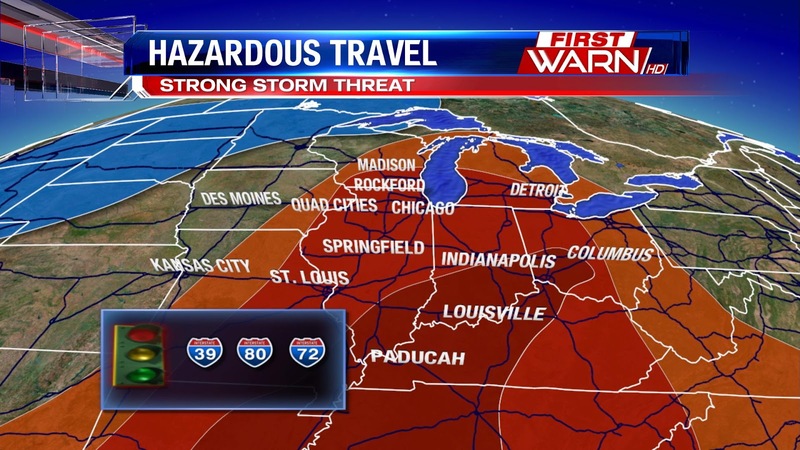 With today being one of the busiest travel days of the year, you'll want to stay 'weather aware' today, as there is a threat for strong to severe storms for the Stateline this afternoon. The rain that moved in this morning is beginning to lessen a bit as dry air filters in. Currently watching to the south west in Missouri where dry air is wrapping in around the low pressure. As the dry air moves it, it erodes the cloud cover in place. If the cloud cover is gone, the sun is able to heat the ground and the instability grows. Instability is a key ingredient for storm develop, and plays into our severe weather threat for the afternoon. We didn't see much instability earlier and thats why the rain and storms stayed below severe limits. So getting into the forecast for tonight and our risk for severe weather. 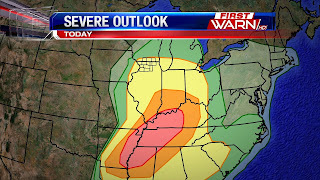 All of northern Illinois and southern Wisconsin is under a slight risk for severe storms (yellow shading). This means that isolated severe storms are possible as we head into the late afternoon. A bigger threat for severe weather is towards the southern tip of the state, southern Indiana and Ohio, as well as into portions of Tennessee and Kentucky with an Enhanced (orange) and Moderate (pink) risk in place. 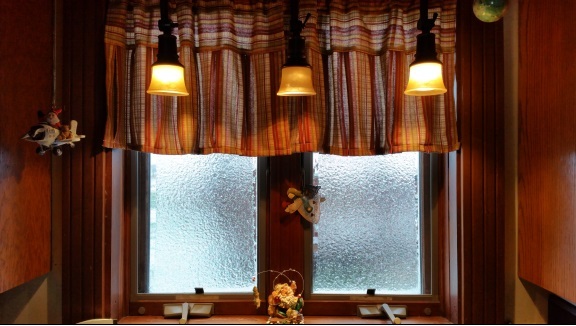 Their hazards include all severe possibilities, heavy rain, strong damaging winds, hail, and even tornadoes. 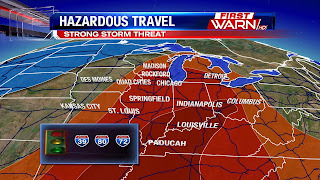 So if you are doing any traveling today make sure you have a way to receive watches and warnings if any are issued. 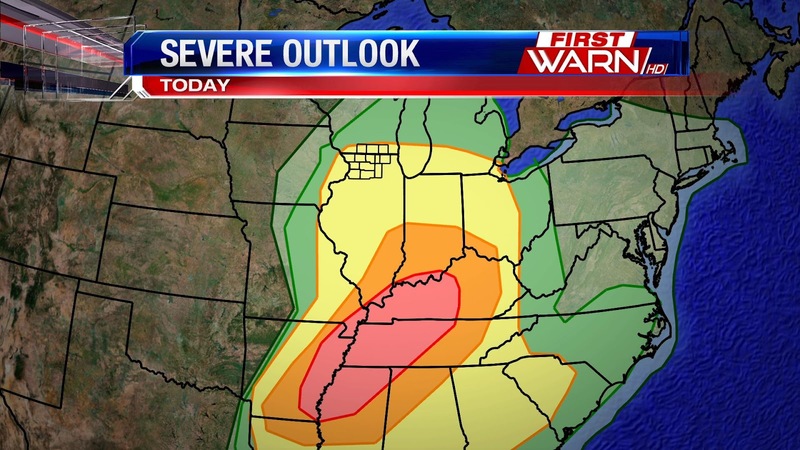 For the Stateline area, our bigger concerns will be heavy rain, fast moving storms, strong damaging winds. There is a smaller risk for a tornado, it is not a zero threat we can't rule one out, but it isn't a large threat. The higher probability area to possibility see a tornado would be near the Mississippi River in northwestern Illinois, because this is where the low looks to track. Near the low pressure, winds will be turning with height, giving a bit of wind shear, which is also needed for strong storms. The timing of these storms looks to be between 4pm and 8pm tonight. This comes as we get the low pressure to track northward into Missouri and Iowa today, and a warm front also lifts northward. We also combine this with a very warm and moist air mass. Temperatures today will break the old record high for today (which is 57° set in 1941) as our temperature already sits at 58°. Our dew points are also very high for this time of year, as they are climbing into the 50's as well. This is increasing the instability which is needed for storms. These storms will be fast movers as well, as they get a lot of help from strong winds in the upper levels of the atmosphere, so you won't have much time to react as the move. Make sure to keep checking back as we will continue to update the blog, facebook, and twitter! 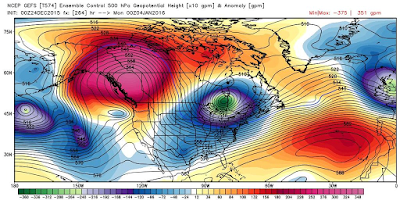 How Warm Will Christmas Week Be? Close to Record Highs this Week? What Does December Usually Bring?